NEW FOR 2017: The Breakout Session PowerPoint presentations are now available for download on the registration site. No copies will be available on-site, so if you want the slides prior to the sessions, please print and bring them with you. To access the presentations, log in to the registration site and select the ' Documents' tab in the upper left-hand corner. The meeting dress code is business casual, and the Thursday event at Chase Field is casual. Your name badge must be worn to all User Group events – meals, meeting sessions, and social events. Pick up your name badge on Wednesday, May 10th during registration in Valencia Foyer before heading out to breakfast on the Alicante Patio from 8-9am. IMPORTANT TO NOTE: If you are attending the Thursday evening event (as indicated during registration), your name badge will contain your ticket to the AZ Diamondbacks game. Please do not lose this ticket, as we do not have replacements. You will be responsible for bringing it to the event on Thursday night. Only those with tickets will be admitted. Wednesday’s meeting sessions will conclude at noon, so you are free to spend the afternoon exploring Scottsdale. The hotel concierge will be available for those wanting assistance in planning your afternoon. Remember to join us back at the hotel for the Welcome Reception from 5:30-7pm at Palm Court. Shuttle buses to Chase Field on Thursday evening will leave the hotel promptly at 5:15, and immediately following the conclusion of the game. If you miss the bus, you will need to secure your own transportation. Download the mobile app by searching ‘Guidebook’ in your App Store (Apple, Google, or Amazon). Sign in using Passphrase: taiusergroup17. We recommend you ‘check-in’ under the Attendees tab to make it easier to network with other meeting attendees. You'll be able to provide immediate feedback on sessions directly in the App. We’ll also be conducting our evaluation and raffle via the app, so please make sure to download it before the conference! 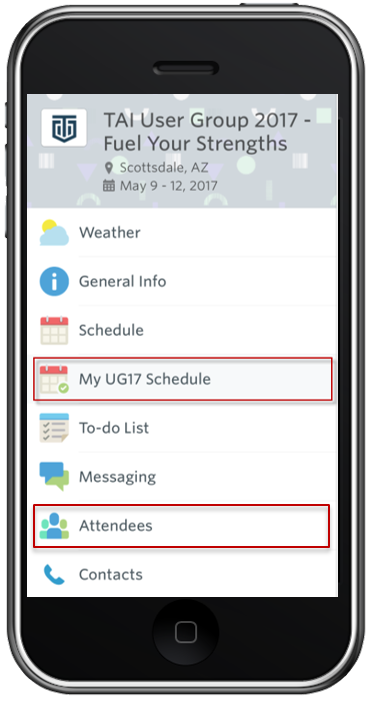 You can access the attendee list and personal agenda from the mobile app as well as the registration site. I've included instructions for both. After downloading the app, you can view other attendees under the 'Attendees' Tab. As mentioned above, 'checking in' under this tab will allow you to interact with other attendees. To view your personal agenda, select 'My UG17 Schedule'. 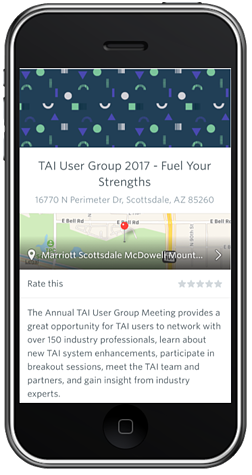 You can view/download/print the 2017 User Group Attendee list and your personal agenda by logging onto your profile on the registration site. We look forward to a fantastic meeting, thank you for joining us!